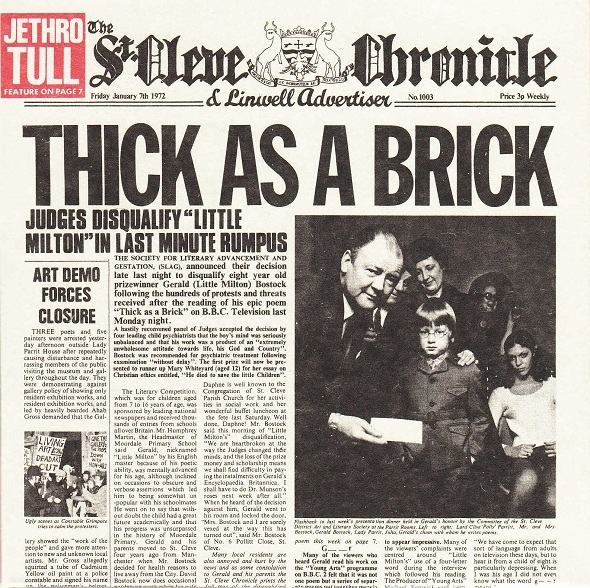 "Thick As A Brick" is a concept album, and the fifth studio album, by the English Progressive Rock band "Jethro Tull". Its lyrics are built around a poem written by a fictitious boy, "Gerald Bostock" a.k.a. "Little Milton" (Ian Anderson himself). The album featured only one song, lasting nearly 45 minutes. "Thick As A brick" is a phrase meaning stubbornly dumb, as one's head is so thick that no new thoughts can enter it. The song starts with Ian Anderson expressing his low expectations for his target ("I may make you feel but I can't make you think") before singing about class structures, conformity, and the rigid moralistic beliefs of the establishment that perpetuates it. The song follows a young boy who sees two career paths: soldier and artist. He chooses the life of a soldier, just like his father. We see him assimilate into the society he once rebelled against, becoming just like his dad. To accommodate the album on LP vinyl and cassette, the seamless track was split on both sides of the record. The original LP was the best-sounding, best-engineered record Tull had ever released, easily capturing the shifting dynamics between the soft all-acoustic passages and the electric rock crescendos surrounding them. It reached #1 on the US Billboard Pop Albums chart.